But the greatest of these is Exchange public-facing, closed-membership distribution groups. Well, it’s a distribution group. With you in it. And it’s public facing. Meaning you can create your own SMTP addresses that others can send to. And then you can create Exchange-based rules that drop those emails into a folder, deletes them after a certain time, runs scripts against them, all sorts of cool stuff before it hits your device or Outlook. All this for my Enterprise of One, Daisetta Labs.net. For $8/month. You might think it’s overkill to have a mighty Exchange instance for yourself, but your ability to create a public-facing distribution group is a killer app that can help you rationalize some of your cloud hassles at home and take charge & ownership of your email, which I argue, is akin to your birth certificate in the online services world. There are others, like career@, blog@ and such. The only free service that offers something akin to this powerful feature is Microosft’s own Outlook.com. If the prefixed email address is available @outlook.com, you can create aliases that are public-facing and use them in a similar way as I do. But that’s a big if. @outlook.com names must be running low. Another, perhaps even better use of these public-facing distribution groups: exploiting cloud offerings that aren’t dependent on a native email service like Gmail. 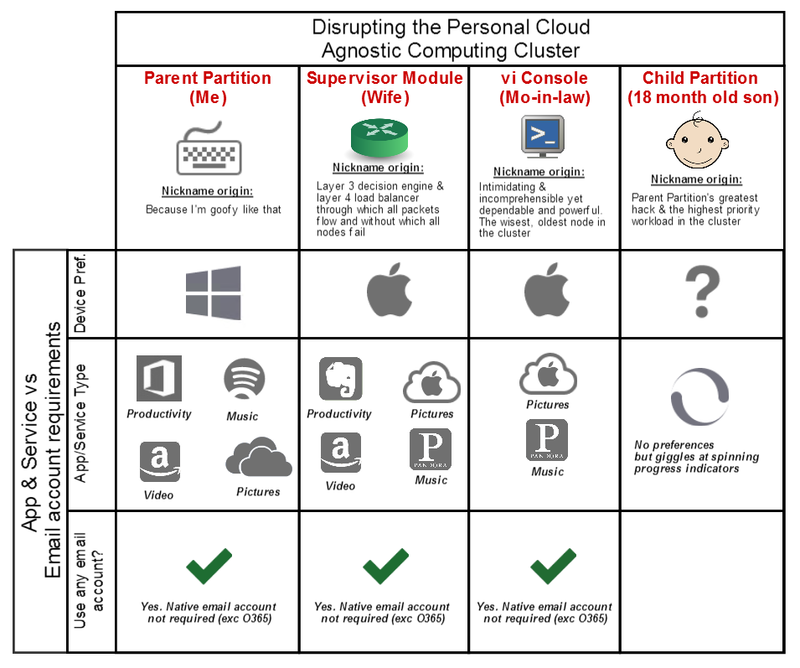 You can use your public-facing distribution groups to register and rationalize the family cluster’s cloud stack! It doesn’t solve everything, true, but it goes along way. In my case, the problem was a tough one to crack. You see, ever since the child partition emerged out of dev, into the hands of a skilled QA technician, and thence, under extreme protest, into production, I’ve struggled to capture, save & properly preserve the amazing pictures & videos stored on the Supervisor Module’s iPhone 5. Until recently, Supe had the best camera phone in the cluster (My Lumia Icon outclasses it now). She, of course, uses Gmail so her pics are backed up in G+, but 1) I can’t access them or view them, 2) they’re downsized in the upload and 3) AutoAwesome’s gone from being cool & nifty to a bit creepy while iCloud’s a joke (though they smartly announced family sharing yesterday, I understand). She has the same problems accessing the pictures I take of Child Partition on the Icon. She wants them all, and I don’t share much to the social media sites. And neither one of us want to switch email providers. Available on iPhone, Windows phone, desktop, etc? Check. All tied into my E1 Exchange instance! It works so well I’m using general@mydomain.com to sync Windows 8.1 between home, work & in the lab. Only thing left is to convince the Supe to use OneNote rather than Evernote. 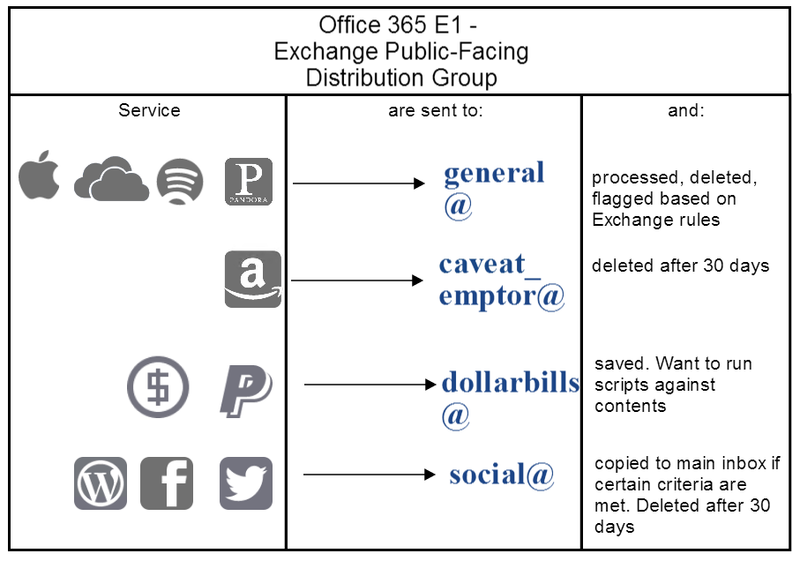 I do the same thing with Amazon (caveat_emptor@), finance stuff, Pandora (general@), some Apple-focused accounts, basically anything that doesn’t require a native email account, I’ll re-register with an O365 public-facing distribution group. Then I share the account credentials among the cluster, and put the service on the cluster’s devices. Now the Supe’s iPhone 5 uploads to OneDrive, which all of us can access. So yeah. E1 & public facing distribution groups can help sooth your personal cloud woes at home, while giving you the tools & exposure to Office 365 for #InfrastructureGlory at work.